Well, I must admit that yet again it didn't go without unpredicted and stressful moments. I run systemd workshops last weekend so I was rather fresh in terms of content knowledge. The only thing left was preparing slides and making sure all demos work offline. So I did. And about 2 hours before meetup beginning I realized, that demos are not working because of some bad imports in Python code. It was a mess - even demos from workshops didn't work. I asked my self WTF couple of times, but somehow found, that this was because of dnf upgrade and some more global pip installs related to systemd libs that I made 2 evenings before and even forgot about it (yep, I work mainly on virtualenvs, but for some reason - not this time). I'm working on a blog post explaining the winding road to systemd/Python development (the hard part is about 4 different libraries being there). I'll publish it within next few days. Btw - I told some of you about discussion on debian.org about systemd integration. So here it is - very good reading. Srsly. That even Debian / Ubuntu centric people are really keen to learn how systemd might help them. E.g. KillMode, journal fields, boot process analyzing, sd-notify Python bindings, dbus - communication & busctl pcap/Wireshark export, handy nspawn containers and so many more. That Python systemd libraries overlaps with each other. Not that big mess, but I really have to sort it out and post about it and ask authors about those overlappings. That systemd hate is actually gone when you talk about details, listen to people problems (and really guys - listen and understand) and explain thoroughly. There's no hate when you treat others equally. I published slides here (not sure why it doesn't work on FF for me, try w/Chrome). 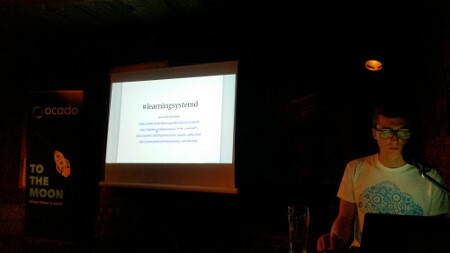 Thanks to organizers (Kasia Wojciechowska, Kamil Herbik & Tomek Tarczyński). Great job with preparations - I love your underground - pub venue!